Full Disclosure: I attended Bronx Science (Class of 94). I think I actually did take electronics in that classroom on the third page. Though, the building was obviously a bit older when I went, it was still a pretty awesome school. In my sophomore year the school got a pair of IBM RS6000 workstations and a dedicated 19.2k internet connection, which was upgraded the next year to 56K. Doesn’t sound like a lot now, but it was pretty amazing for a high school at the time. I remember installing one of the early builds of Mosaic when it came out and just being bowled over by it. I used to use it everyday to download weather maps for a meteorology class I was taking. I also remember going to the Mosaic (or it may have been GNN) home page all the time to look at the “New Sites” section which was literally a listing of all the new websites that came online. There is a secret to the pace-setting science high school. Your school may have it; you need it yourself. NEW YORK’s celebrated Bronx High School of Science has a spanking new modem building, well equipped laboratories, 2500 pre-selected, scientifically inclined students (each of whom has won out in fiercely competitive entrance examinations), and one out of five teachers is a Ph. D. It would be surprising if “Science, ” as its students call it, didn’t send finalists to the National Science Fair and the Westinghouse Talent Search, and if its students didn’t win Armed Services scientific awards, scholarships, and honors of all kinds by the hundreds. It is, in a word, one of the finest scientific training grounds in the country. Bledsoe County High School in Pikeville, Tennessee (Pop. 1000) has a building erected in 1927, practically no laboratory equipment, not even one Ph. D., and 400 students selected only by the fact that they live in the area. Yet from an almost standing start five years ago Bledsoe’s science program has expanded so rapidly that already the school has to its credit one Navy Science Cruise Award winner, one Air Force Award for an outstanding science project, and one National Science Fair finalist. This year it swept the Regional Science Fair in competition with 15 other schools, taking 26 of 45 prizes, including all of those offered in physics. Many of its students spend more time working on outside science projects than they do talking on the telephone, going to the movies, driving hotrods, or doing any of the other things in which teenagers are supposed to be so interested. Pikeville, Tennessee, has become a hotbed of scientific enthusiasm. Each of these schoolsâ€”Bledsoe County and Bronx Scienceâ€”in spite of the vast differences between themâ€”has been outstandingly successful in firing the scientific zeal of its students. 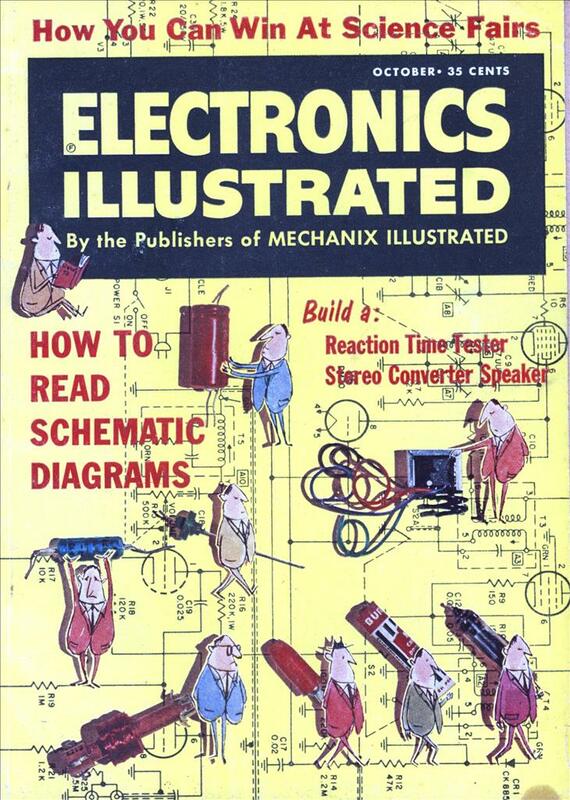 Electronics Illustrated set out to learn what they had in commonâ€”why each is able to guide its students into scientific pursuits far more effectively than most American high schools. Surprisingly enough, the one vital secret of success turned out to be the same in each case. Behind each school stands one enthusiastic, dedicated teacher who had the vision, the energy, and the determination to make science vital and exciting to the students. And in each case, this contagious enthusiasm has spread throughout the faculty and student body until the whole school is bursting at the seams with it. When Mrs. Thelma Boynton, an attractive mother of three boys, began to teach at Bledsoe five years ago, there had never been a science fair in the region, the school had no laboratory equipment to speak of, textbooks had not yet recognized the birth of the atomic age, and the students could not have been less interested. Mrs. Boynton realized that the first step was to make the studentsâ€”and the town’s people, too â€”science conscious. A trip to the Tennessee Junior Academy of Science for 140 students was the first step in her well-planned campaign. 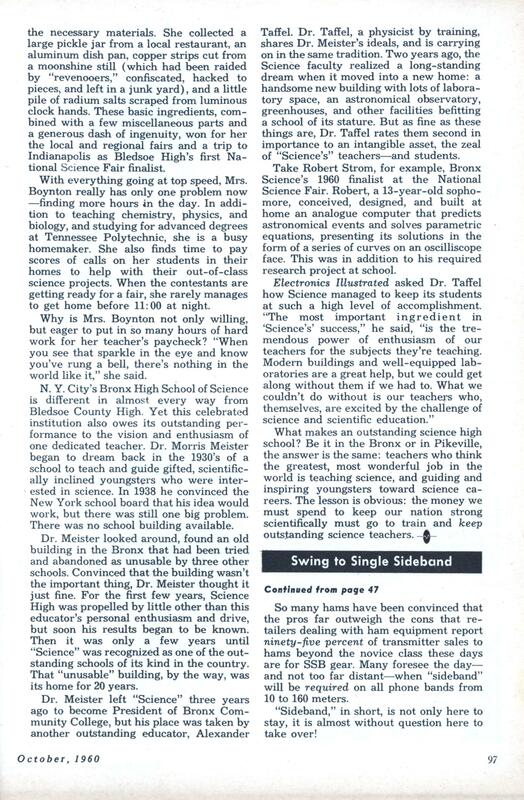 Next came a tour of the Oak Ridge atomic [Continued on page 96] facilities In the meantime, Mrs. Boynton began to bring the science courses up to date and transfer to her students some of her own excitement over recent scientific developments. Soon, some students began to start small science projects, and Mrs. Boynton began to lay plans for a local science fair. To let Pikeville know what was going on, Mrs. Boynton arranged for her students with projects to appear on a Chattanooga television program. A local furniture store set up receivers in the school so that those remaining behind could see their classmates on TV. Excitement among the students began to mount. The town was beginning to take pride in its young scientists, too. And everyone began to look forward to the first science fair. Business firms, civic groups, and individuals chipped in to raise the more than $100 needed for prizes and expenses connected with the fair. And finally, with 188 exhibits, Pikeville’s first science fair, held on Saturday, April 5, 1958, was a huge success. Mrs. Boynton took some 30 of the local winners on to the Regional Fair, where Bledsoe County’s students took no top award, but did place in some divisions. After the Regional, they went back home fired with determination to do better next year. In the spring of 1959, 210 students entered the Pikeville local fair, and of those who went on to the Regional, Bledsoe County’s Billy Redmond won a Navy Science Cruise Award with his homemade meteorological station. To help keep interest high, Mrs. Boynton arranged another TV appearance. “The regional fairs did us a lot of good, ” said Mrs. Boynton. “Our exhibits were getting better each year as our students saw what other schools were doing. ” By the fall of 1959, Bledsoe students proved her right by sweeping all awards at the Regional Tennessee Junior Academy of Science. They went on to capture several places at the State Junior Academy meet One of the big problems through the past few years has been moneyâ€”or rather, the lack of it. Transportation to and from fairs, equipment and materials for projects, prizes for winners, special books and reference materialsâ€”all cost money. Although the town’s people, civic clubs, and businesses all helped to support the work of the town’s young scientists, there was still a shortage of funds. In some cases, the teachers made up the difference out of their own pocketsâ€”one fair cost Mrs. Boynton a month’s pay before it was over. The students decided on a do-it-yourself project to raise money. Their first idea: talk to the basketball coach and get permission to operate a soft drink concession. Then someone suggested that the science club might become a kind of collective correspondent for the Chattanooga News Free Press. The most pressing problem now is the lack of scientific equipment in the school laboratory. Commercial scientific equipment is expensive, and the entire science department has a budget of only $200-$300 a year. This takes care of everything from chemical and biological supplies to physics equipment to pencil sharpeners. Again the students decided on a do-it-yourself approach. They solicited old radios from the people in Pikeville, dismantling them and used the parts in electronic experiments. Many students who have built science fair projects that would be useful as laboratory equipment have donated them after exhibition. Impressed by the activity in the science department, the Bledsoe County School Board recently managed to spearhead an effort to raise enough money, under a joint City-State-Federal program, to buy a microscope and sixteen modern laboratory desks with facilities for gas and water. A lack of materials and facilities fails to dampen the teacher’s or the class members’ enthusiasm for science. Saundra Sanders, for example, a pretty, 17-year-old junior at Bledsoe, read a biography of Albert Einstein for a book report in English last year. Fascinated by the great theorist’s ideas, Saundra read everything that she could find on the subject. When it came time to pick a science fair project this year, she chose an exhibit explaining the mathematical derivation of Einstein’s ideas on matter and energy as summarized by his famous equation, E=mc2. To illustrate the interchangeability of matter and energy, she built a cloud chamber, showing the radioactive decay of radium. Short of equipment and standard parts, Saundra set out last August to gather the necessary materials. She collected a large pickle jar from a local restaurant, an aluminum dish pan, copper strips cut from a moonshine still (which had been raided by “revenooers, ” confiscated, hacked to pieces, and left in a junk yard), and a little pile of radium salts scraped from luminous clock hands. These basic ingredients, combined with a few miscellaneous parts and a generous dash of ingenuity, won for her the local and regional fairs and a trip to Indianapolis as Bledsoe High’s first National Science Fair finalist. With everything going at top speed, Mrs. Boynton really has only one problem now â€”finding more hours in the day. In addition to teaching chemistry, physics, and biology, and studying for advanced degrees at Tennessee Polytechnic, she is a busy homemaker. She also finds time to pay scores of calls on her students in their homes to help with their out-of-class science projects. When the contestants are getting ready for a fair, she rarely manages to get home before 11: 00 at night. Why is Mrs. Boynton not only willing, but eager to put in so many hours of hard work for her teacher’s paycheck? “When you see that sparkle in the eye and know you’ve rung a bell, there’s nothing in the world like it, ” she said. N. Y. City’s Bronx High School of Science is different in almost every way from Bledsoe County High. Yet this celebrated institution also owes its outstanding performance to the vision and enthusiasm of one dedicated teacher. Dr. Morris Meister began to dream back in the 1930’s of a school to teach and guide gifted, scientifically inclined youngsters who were interested in science. In 1938 he convinced the New York school board that his idea would work, but there was still one big problem. There was no school building available. Dr. Meister looked around, found an old building in the Bronx that had been tried and abandoned as unusable by three other schools. Convinced that the building wasn’t the important thing, Dr. Meister thought it just fine. For the first few years, Science High was propelled by little other than this educator’s personal enthusiasm and drive, but soon his results began to be known. Then it was only a few years until “Science” was recognized as one of the outstanding schools of its kind in the country. That “unusable” building, by the way, was its home for 20 years. Dr. Meister left “Science” three years ago to become President of Bronx Community College, but his place was taken by another outstanding educator, Alexander Taffel. Dr. Taffel, a physicist by training, shares Dr. Meister’s ideals, and is carrying on in the same tradition. Two years ago, the Science faculty realized a long-standing dream when it moved into a new home: a handsome new building with lots of laboratory space, an astronomical observatory, greenhouses, and other facilities befitting a school of its stature. But as fine as these things are, Dr. Taffel rates them second in importance to an intangible asset, the zeal of “Science’s” teachersâ€”and students. Take Robert Strom, for example, Bronx Science’s 1960 finalist at the National Science Fair. Robert, a 13-year-old sophomore, conceived, designed, and built at home an analogue computer that predicts astronomical events and solves parametric equations, presenting its solutions in the form of a series of curves on an oscilliscope face. This was in addition to his required research project at school. What makes an outstanding science high school? Be it in die Bronx or in Pikeville, the answer is die same: teachers who think the greatest, most wonderful job in die world is teaching science, and guiding and inspiring youngsters toward science careers. The lesson is obvious: the money we must spend to keep our nation strong scientifically must go to train and keep outstanding science teachers. Apple I? Those are worth $15,000 today! Check out my Apple ][ and //e YouTubes! My college had to send programs out to be keypunched. I used a slide rule to do calculations in high school chemistry. My high school had a one semester slide rule class. If you don’t mind us asking, what profession have you persued since then? I’m a software developer 🙂 Our graphics class had SE/30’s which were actually pretty great machines. First there was the Mac II, then the Mac IIx. There was a Mac SE, then…? It’s a good thing I didn’t name them. The SE/30 looked just like an SE (pretty much like a mac plus) but it had a 68030 processor and, I think, a hard drive. The SE/30 was basically a IIcx magically fitted into an SE enclosure. A wolf in sheep’s clothing as it were.